The 'Oblivion' actor is so determined to see his six-year-old daughter - who lives with her mother Katie Holmes in New York City following the couple's divorce last August - on her birthday he has splashed out £3 million on a Cessna Citation private plane to fly her out to visit him. 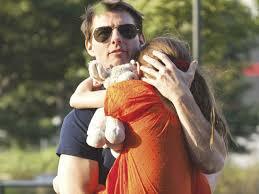 A source told The Sun newspaper: "Money is no object to Tom when it comes to Suri. He'll do anything to be with her. "It might sound extravagant but Suri is used to flying around in private jets. That's what happens when your parents are Hollywood stars." After her special seventh birthday visit on April 18, Suri will have permanent access to the jet, which is based at a Manhattan heliport. This isn't the first time Tom, 50, has hired a plane for his daughter since Katie was awarded sole custody of her last summer. He arranged for Suri to be flown out to London for five days in February, where he was filming sci-fi movie 'All You Need is Kill'. The actor also treated the little girl to a luxurious trip to Disney World in Orlando, Florida, last August where they spent the night in the exclusive Cinderella Castle.